A4 Size 7.3 x 10.8 in. (186 x 273 mm) 8.3 x 11.7 in. (304 x 447 mm) 13 x 19 in. The “Sadhana of Mahamudra, which quells the mighty warring of the three lords of materialism, and brings realization of the Ocean of Siddhas of the Practice Lineage,” is a practice revealed by Chogyam Trungpa (1939-1987), which combines the Mahamudra practices of the Kagyu Tradition with the Atiyoga or Dzogchen practices of the Nyingma Tradition. The transmission of this Kagyu-Nyingma terma or ‘revealed treasure’ sadhana took place in Bhutan over a three-week period in 1968, when Chogyam Trungpa was staying at Taktsang Monastery, having been invited there by the Queen of Bhutan. Prior to this he had been staying with the Karmapa at Rumtek Monastery in Sikkim, where the 16th Karmapa gave him the empowerment of the 2nd Karmapa, Karma Pakshi (1204-1283). Just after arriving in Bhutan he also received the empowerment of Dorje Drolo from Dilgo Khentse Rinpoche. Taktsang (Tib. tag-tshang), meaning ‘Tiger’s Lair’, is a 17th century monastic complex perched high on a cliff above the Paro Valley in Bhutan, and was built around the most sacred of thirteen ‘tiger-lairs’ where Guru Rinpoche practiced in the 8th century. In each of these sites he manifested in his extremely fierce aspect as Dorje Drolo (Skt. Vajra-lambdara), meaning the ‘Pot-bellied Vajra’, in order to subdue the most malevolent and arrogant spirits that inhabited these regions, with the transformed aspect of his karmic-consort, Tashi Chidron, serving as his ferocious tigress vehicle or mount. The environment of this composition is the secret charnel ground of a blazing mountain that arises from the subjugated corpse of Rudra, which is triangular in shape and pierces the sky ‘with the blue light of Vajrasattva’. On top of this mountain is a red triangle, a fragrant hundred-petal lotus, a white moon and golden sun disc, which transform into the syllables HUM,HUM,HUM and then into the form of Dorje Drolo: with the 2nd Karmapa, Karma Pakshi (1204-1283), being Dorje Drolo’s ‘body’ aspect; the 8th Karmapa, Mikyo Dorje (1505-1554), his ‘speech’ aspect; and the 16th Karmapa, Rangjung Dorje (1924-1981), his ‘mind’ aspect. 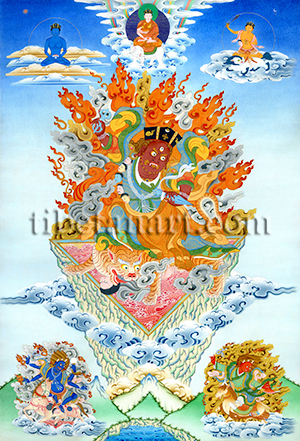 Respectively these three aspects of body, speech and mind are personified in the forms of white Vairocana, red Manjushri, and blue Samantabhadra who appear amidst clouds in the sky above. Dorje Drolo is dark-red or maroon in colour and terrifying in appearance, as if the three worlds were on fire. His presence is overwhelming, with a radiance that outshines the sun and moon, while his three round red wisdom eyes stare in every direction. He expresses his wrath by biting down upon his lower lip with his sharp upper teeth and fangs, his orange facial twists upwards and emits fiery sparks, and his matted hair-locks hang down as a tawny mass of curls. With his right hand raised towards the heavens in the threatening tarjani gesture he holds a nine-pointed vajra made of meteorite iron that emits a storm of fiery sparks, with each spark taking the form of the syllable HUM, which subdue all spiritual pride. In his left hand he holds a phurba or dagger made of meteorite iron, which emits a shower of sparks in the form of thousands of Mahakalas. The sharp triangular point of this phurba pierces through the hearts of all demonic enemies. He wears gold and bone ornaments, and like Guru Rinpoche three robes that signifying his accomplishments of discipline, meditation and wisdom. The first is an inner ‘secret’ white robe, showing he has perfected the bodhisattva-vehicle. The second is a blue robe symbolizing his perfection of the mantra-vehicles. The third is the outer yellow and red embroidered monastic robe of a bhikshu, representing his perfection in upholding all of the pratimoksha vows. As the originator and master of all buddha activity, he wears the black-hat or vajra-crown of the Karmapa. He abides within a blazing mass of awareness-fire and swirling wind, as he stands upon his dakini-consort in the fierce form of a pregnant tigress, with his right leg bent and his left leg extended in heruka-posture. The tigress tramples upon the form of an enemy-demon, who lies upon his back above a triangular dharmodaya or blissful ‘reality-source’, which crowns the summit of the ‘blazing mountain’ and contains a swirling ocean of fresh blood. At his forehead centre is the unchanging form of Vairocana (top centre), who is the 1st Karmapa, the Dharmaraja Dusum Khyenpa (1110-1193). He is peaceful and white in complexion, and wears the red monastic robes of a bhiksu and the Karmapa’s black-hat, which is adorned with a golden wheel or dharmachakra. He sits in vajra-posture on the back of a white elephant, with his two hands holding a vajra and resting upon his lap in the gesture of meditation. At his throat centre is Manjushri (top right), the ‘Lord of Speech’, who is the 8th Karmapa, Mikyo Dorje (1507-1554), and the unceasing voice of Mahakala. He is orange in colour, wears a tiger-skin loincloth and a human-skin as a shawl around his shoulders, and rides upon the back of a white lion. With his right hand he holds aloft the sword of wisdom that cuts through the root of all ignorance and unconscious illusions. In his left hand he holds a golden vase in front of his heart that contains the treasure of the dharma. His face radiates friendliness, and as the Lord of the Padma Family, he wears Karmapa’s black-crown ornamented with a golden lotus, as a symbol of the red light of Amitabha Buddha. Emanating from the heart centre of Dorje Drolo, the great wrathful one, is the Lord of the Tathagata Family, the 16th Karmapa, Rangjung Dorje (1924-1981), who represents Vajrasattva's innate nature of ceaseless awareness. He is deep-blue in colour with a peaceful face that expresses the state transcending any boundary between meditation and non-meditation. His eyes gaze into fathomless space, and having achieved the highest state of simplicity he is naked and unadorned. He sits in vajra-posture with his hands resting upon his lap in the gesture of meditation, as he holds a white skull-cup filled with amrita, the nectar of immortal wisdom. As the Lord of the Vajra Family he wears the black-crown ornamented with a golden vajra, and radiates the blue light of Samantabhadra – the ‘All Good’. In the lower left and right corners of this thangka are two principal female and male protectors of the Karma Kagyu tradition, Rangjung Gyalmo and Garwa Nagpo. Rangjung Gyalmo, the ‘Self-Created Queen’, is an aspect of Shri Devi (Tib. Paldan Lhamo), who rides side-saddle upon her mule amidst a maelstrom of storm-clouds and above a swirling ocean of blood. The flayed skin of a cannibal-demon encircles her mule, with its head hanging downward and its limbs knotted horizontally around the mule’s body. The mule’s reins are fashioned from poisonous serpents, and the magical weapons of a ‘ball of variegated thread’, and a ‘skin-sack full of contagious diseases’, hang from her saddle. Her mule has three eyes that gaze over the past, present and future, with the third 'eye of the future' appearing on its rump. She is extremely wrathful and blue-black in colour, with four arms, three round red eyes, a gaping mouth, sharp fangs, and upward blazing head and facial hair. She wears gold and bone ornaments, a five-skull crown adorned with a crescent moon, a garland of severed heads, a tiger-skin skirt, and a billowing outer robe of embroidered blue-black silk. With her first right hand she holds aloft an iron trident, and with her second right hand she holds a dagger or phurba made from meteorite iron. With her first left hand she holds a magical silver mirror, and with her second left hand a serpent-noose. Garwa Nagpo (Tib. mgar-ba nag-po), the ‘Dark Blacksmith’, serves as the principal ‘minister’ or emanation of the oath-bound protector, Damcan Dorje Legpa, who was subjugated by Guru Rinpoche. He is wrathful and dark red in colour, with three round red eyes, a gaping mouth that reveals his four sharp fangs, and his facial and tawny-yellow hair blazes upward like an uncontrollable forest fire. He wears golden ornaments, a five-skull crown, white-soled felt boots, and nine garments of embroidered and multicoloured silk. With his right hand he wields aloft his indestructible foundry-hammer, with which he crushes and pulverizes all enemies personified as emotional defilements. The hammer’s head is fashioned from a solid lump of cast iron, with a jeweled handle and is sealed at its top with three half-vajras. With his left hand he pumps wind through his tiger-skin bellows, which blows all enemies into dust. His vehicle is a brown male goat with twisting blue horns, which he rides amidst a maelstrom of blazing awareness fire and billowing storm clouds.